The campaign has 4 different stories from 4 different perspectives, but the overall story is that you are trying to keep all the land for yourself. Other than that, there isn’t really much of a story. Does the game of Risk have a story? No, you just want to conquer the world. Greed Corp is a very interesting game. Its main focus is on turn based strategy and I am going to assume that everyone knows what that is. If not then go here. The aspect that sets this game apart from other strategy games is the “Don’t Break The Ice” feel, I included a link for the people out there who don’t know what “Don’t Break The Ice” is (I asked around, and a lot of people have never heard of the game). Like most strategy game, you need resources to build buildings or units. To get these resources you must use harvesters. Harvesters slowly break apart the land that you are on. So as turns go by, the harvesters continue to break the land. The height of the land determines how many turns are left before that piece of land will completely disappear. A cracked piece of land only has one more turn before disappearing. This adds more strategy since you need land to make armies and move around, but you must destroy land in order to make money to build the units. How much land are you willing to destroy? I have played a game where the people had to start using air transports in order to get to each other, because each player only had 3-4 blocks of land they were based on. Units can pretty much move to any piece of land that you own and is connected to the current land by any number of other lands that you own; however, you must be adjacent to a spot in order to go into the spot that you don’t own. The only exception to this rule is when using a flying transportation vehicle, you can land what you are flying anywhere, but if the enemy can overpower you, you will just lose those units. The soundtrack is comprised of classical sounding music. But is not a huge focus within the game. The sound effects are the main focus. Everything makes some sort of noise that signifies that it has done something. Such a huge focus was put into the sound effects that each of the 4 teams has separate sound effects. If you wanted to, you could look away from the TV and know exactly what your opponent moved, built, or added. Only thing you couldn’t tell is where they moved to. The achievements are pretty straight forward, the first 4 are based off of the campaign, these rest can be gotten in any way. Lost in the Wave – Destroy an enemy unit or building with a chain reaction (Freemen campaign). 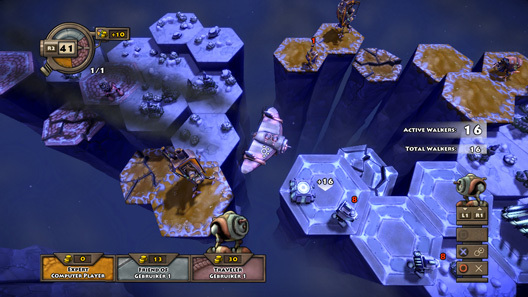 Island of Doom – Destroy an enemy island of at least 3 tiles by strategically placing a harvester (Pirate campaign). With Cannon, you can – Fire a free shell from a free cannon at the enemy you captured it from (Cartel campaign). Fear of Flying – Win a match without using a carrier (Empire campaign). Global Warfare – Complete the entire campaign. Moving Through the Ranks – Earn 9 titles. Daylight Saving – Win a match without the time expiring in any turn (Skilled/Expert). Got it covered – Build enough armed cannons to cover all remaining tiles in the map (Skilled/Expert). Financially Independent – Win a match before the supporting funds go up (Skilled/Expert). Use it Wisely – Earn a combination of credits, tiles and carriers as an elimination bonus (Skilled/Expert). One at a Time – Win by fighting all enemies 1 at a time (4P, Skilled/Expert). Manual Override – Win while only losing harvesters through self-destruct, own 1 or more each turn (4P, Skilled/Expert). The combination of real time strategy and Don’t Break the Ice leads to a very unique strategy game. The strategy no longer depends on your units alone, but now also on what land you destroy to build those units. 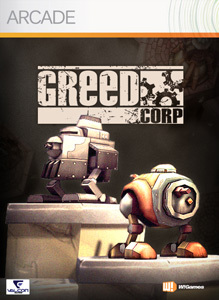 Greed Corp is a new strategic experience that is welcomed to the strategy genre. I give Greed Corp 8 Capsules out of 10. The unique strategy element is a welcomed addition. There isn’t a huge complication of troops or buildings you can make, so it is easy to pick up and enjoy. As far as strategy games go, this one is one of the most fun. There aren’t many things to build, and thus reduce your strategic options. Many games pretty much play the exact same way since there aren’t different buildings or units to build. Easy to pick up, as seen in the pros, but for more die hard strategy there will always be a feeling of lack of strategy due to there not being a lot of options.